Iberian shoulder of Aracena. You can buy it as a whole piece, deboned or cut manually and vacuum packed in packs of approximately 100 grams. This palette comes from the Iberian pig raised in semi-freedom, so they acquire a fine cane and have a diet based on cereals, fruits and wild herbs from the pasture. Acorn-fed Iberian shoulder "CERTIFIED WITH 100% IBERIAN BLACK PRECINCT" You can buy it as a whole piece, deboned or cut manually and vacuum packed in packs of approximately 100 grams. Palette from Iberian pigs fed in the montanera based on chestnuts, wild herbs and mainly ACORNS. Iberian acorn-fed ham " CERTIFICATE WITH 100% IBERIAN BLACK SEAL" You can buy them as whole pieces, boned or cut by knife and vacuum packed in packs of approximately 100 grams Ham from Iberian pigs fed in the montanera based on chestnuts, wild herbs and mainly ACORNS. LIQUORS AND CRAFTS CREAMS "MARTES SANTO"
Bellota loin of Iberian acorn, from Iberian pigs fed in the montanera based on chestnuts, wild herbs and mainly ACORNS. * Sale format: Sliced ​​with a weight of 100gr. Craft pates handcrafted in the heart of the Sierra de Aracena, with selected livers. 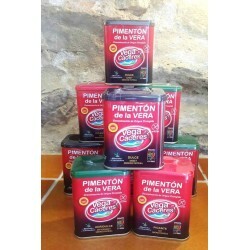 "PATES DON ROGELIO" * Sales format: Pack assortment of the 6 varieties. - Ham paté. - Pork loin pate. - Paté al pedro ximénez. - White pepper paté. - Paté fine herbs. - Classic pate. 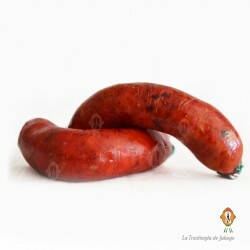 Chorizo and Salchichón without gluten and without lactose, iberian saw, products of the quality of always. Format: Piece of 265gr. CHEESE SIERRA DE ARACENA "DOÑA IRENE"
Sierra de Aracena Cheese "Doña Irene" Goat cheese made with handcrafted milk, cured in the Sierra de Aracena. Cheeses of traditional flavor of semi-intense goat * Sales format: individual piece of 450GR approx. of 0.850gr aprox * TYPES: - Fatty Curing - Cured rosemary - Cured with paprika - Cured in olive oil - Persian cheese "pestoso"
HONEY SAW TO ARACENA "ONE THOUSAND FLOWERS"
Honey made with a totally artisanal process based on nectar and other sugary substances that bees collect in the Sierra de Aracena, located in the Natural Park of the Sierra de Aracena and Picos de Aroche. * Sales format: You can choose between boats with an approximate weight of 500gr, 1kg 2kg and 5kg. Iberian Shoulder "CEBO DE CAMPO" certified (GREEN PRECINCT AT 50% IBERIAN)You can buy it as a whole piece, deboned or cut manually and vacuum packed in packs of approximately 100 grams. 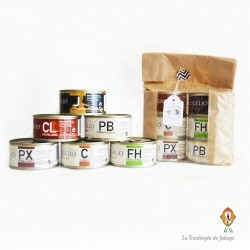 Product made according to the tradition of Jabugo with the best Iberian meats. Its natural wrapping is pork tripe, so its healing is slow and artisan. 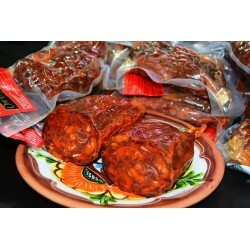 * Sales format : can be purchased in half pieces (500 gr approx) or in whole pieces (approx 1Kg) . Sausage made with Iberian pork meat and fat. Product suitable for cooking, roasting and barbecues. * Sale format: pack of 2 jabuguitos with a weight of approx. of 200g. HAM IB. hacksaw of Aracana Coming from Iberian pigs reared in intensive regime, fed with cereals and legumes (wheat, corn, barley, beans, etc).You can buy it as a whole piece, deboned or cut manually and vacuum packed in packs of approximately 100 grams. 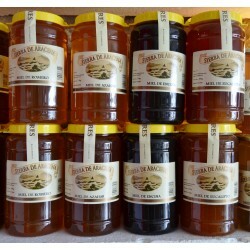 En La Trastienda de Jabugo encontrarás la mejor selección de productos de la Sierra de Aracena, productos artesanales elaborados con cerdos ibéricos. Disfruta de nuestro jamón ibérico de bellota o del inconfundible sabor del jamón de Jabugo. 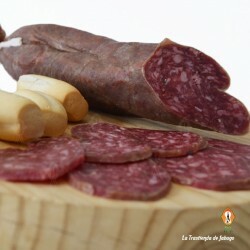 Prueba los embutidos ibéricos y quesos artesanales de la zona, nuestros patés artesanos, cremas y licores, los productos gourmet, lotes y mucho más. Somos especialistas en jamón ibérico, quesos artesanales y productos de la sierra. 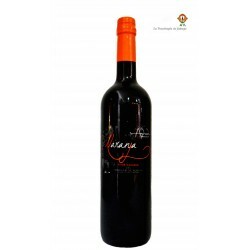 Visita nuestra tienda online y disfruta del inconfundible sabor de los auténticos productos ibéricos. In La Trastienda de Jabugo you will find the best selection of products from the Sierra de Aracena, handmade products made with Iberian pigs. Enjoy our Iberian acorn-fed ham or the unmistakable flavor of Jabugo ham. Try the Iberian cold meats and local artisan cheeses, our craft pates, creams and liqueurs, gourmet products, lots and much more. 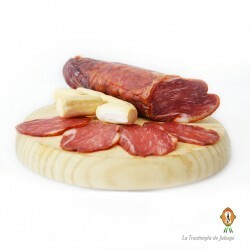 We specialize in Iberian ham, artisan cheeses and products from the mountains. 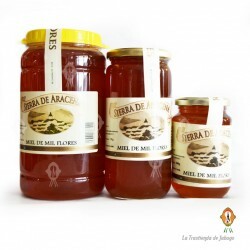 Visit our online store and enjoy the unmistakable taste of authentic Iberian products.